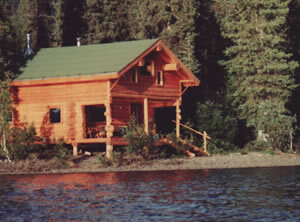 Peace of Selby Wilderness, a wilderness lodge based at Selby Lake in Alaska's Brooks Range, north of the Arctic Circle. We offer a unique combination of majestic pristine wilderness, a diversity of accommodations, and a sincere concern for you, our guest. The eight million acre Gates of the Arctic National Park and Preserve surrounds Peace of Selby and offers our wilderness lodge guests solitude and serenity. Rugged mountains and clear pure free-flowing National Wild and Scenic Rivers provide exceptional Alaska adventures: trekking, wildlife viewing, fishing, canoeing, and river rafting. The Brooks Range is prime habitat for black and grizzly bear, moose, caribou, wolf, wolverine, fox, marten, beaver, otter, and a wide diversity of nesting Arctic birds. Northern pike, grayling, and lake trout inhabit the lakes, while sheefish and chum salmon migrate up the Kobuk River... A naturalist's paradise. Our wilderness lodge features comfortable frontier-style living. Our specialty is designing a unique wilderness experience for you, based on your desires and capabilities.